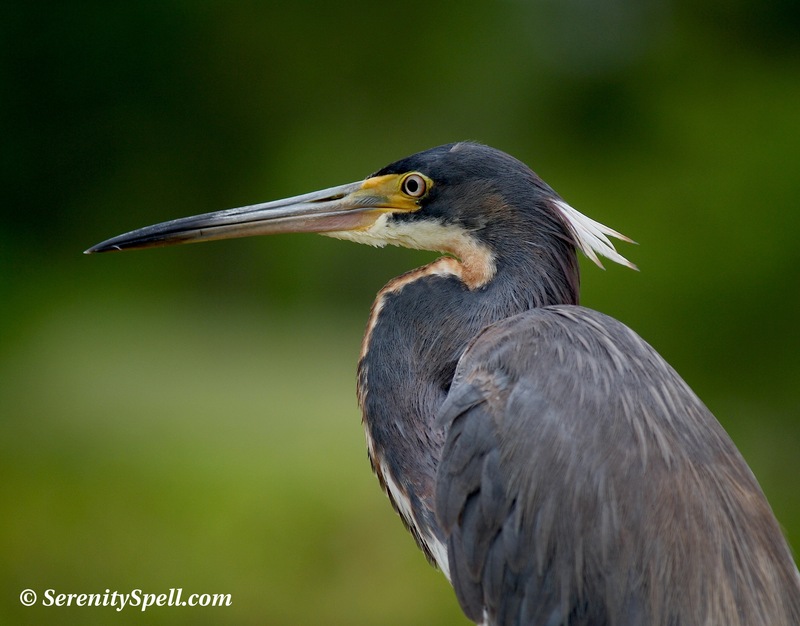 As recently mentioned — in Tricolored Herons: The Young Ones — there are a few physical differences between the juveniles and adults of the species Egretta tricolor. Beautiful blue feathers cover most of this heron’s body, save a white-striped chest and belly, and a rust-colored neck. The juveniles eventually lose much of the rust coloring, with only a bit of the hue peeping through the slate blue feathers as they age. The eyes of the juveniles are a yellowish-white, turning brown with pink inner margins into adulthood. Males and females of the species look alike. Below, an adult female carefully watches over her nest, recently built with her mate and filled with a precious cargo. 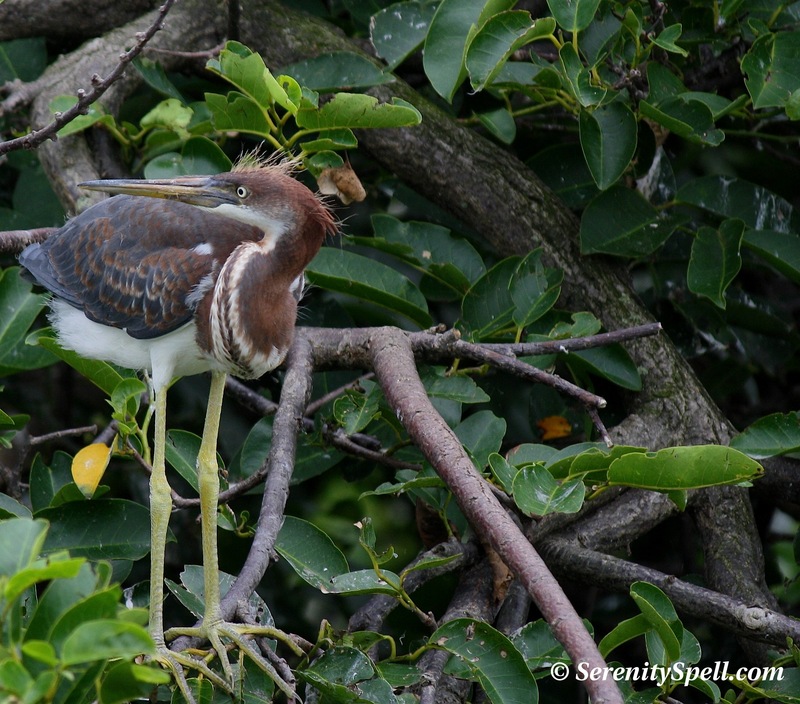 Another fishes in the brown-tinted waters of the wetlands (hued as such by the mangroves and other tree roots) — most likely a parent, as both Tricolored Heron males and females hunt for their young. We’re fortunate to have secure and protective habitats for these most lovely creatures; without continued preservation efforts however, many amazing and unique ecosystems — the Everglades, Longleaf Pine, Scrub, Mangrove, and more — will remain in decline. As they disappear, so do the plant species and wildlife that depend upon them for survival. According to the study Endangered Ecosystems: A Status Report on America’s Vanishing Habitat and Wildlife, Florida contains ecosystems at the most risk. There are no other Everglades; it behooves us to not only protect what’s left, but to return what we’ve so rudely taken. They have such small eggs! “…rudely taken” ….isn’t that so?! And with an attitude of entitlement that goes beyond fulfilling necessities. Thanks for these photos. I’ve been following the growth of the baby herons on the Cornell Labs webcams. It’s neat to see the differences in colours between the birds. The Great Blue has a yellow bottom beak, for instance. 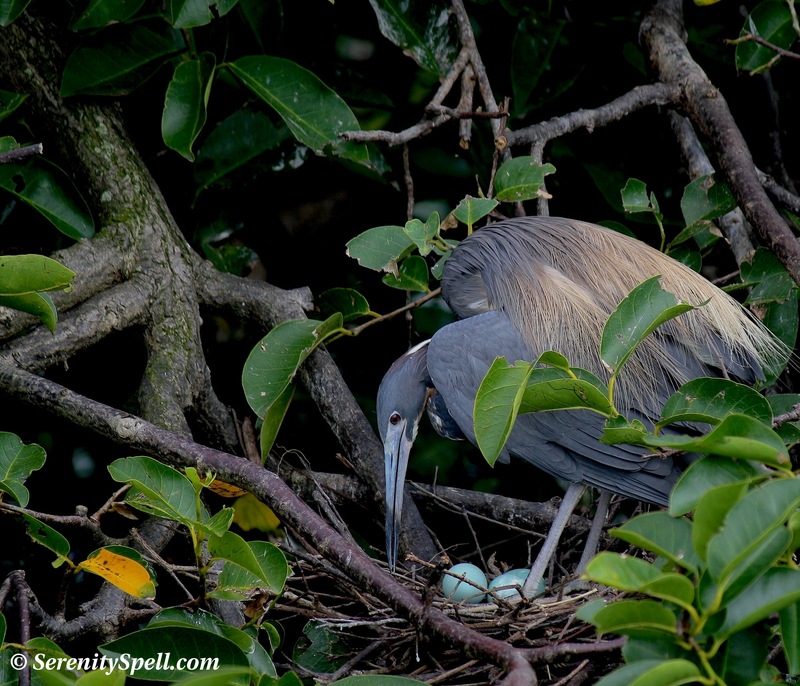 Yep, these herons aren’t too large — but the eggs aren’t tiny, either. I took this with a telephoto from a decent distance (the nest was on a tree island), and I could see the eggs clearly with the naked eye. Lovely blue shades! I’m so glad you enjoyed the images… And I love the Cornell Labs webcams, too! These guys nest alongside the Great Blues, actually (and egrets) in our wetlands. I wish we could give back so much of the ‘Glades — we’ve taken too much. But baby steps… I just learned that after years of effort, some sugarcane fields are finally going to revert to their natural state! GREAT news. These herons are also known as Louisiana Herons. If I remember correctly Audubon observed them in Louisiana and may have been the one to name them so. This species is very dainty and much smaller than the White Egret or the Great Blue Heron. So for some reason the Southern Belle angle on this bird always fit for me. Another eye color observation is that when they are mating their eyes become ruby red. You have captured that in this series with the yellow eyes of the non breeding adult and the red of the nesting shot..complete with its cascade of coppery breeding back plumes too. Sometimes the legs become bright red also and the skin around the beak goes from yellow to practically flourescent blue/purple early in the breeding season. These are among the most colorful of our wading birds. I get a kick out of the young ones too….they scamper about the branches like monkeys ..especially when mom or dad lands with food!! I like the fishing shot a lot with the frozen drops of water sparkling and making shadows on the bird!! In my Young’Uns post I mention the Louisiana naming, but it’s interesting — that term has really been forced out of academic dialogue (was it the ’80s when it switched?). Many here still reference it as the Louisiana Heron though. I love the angled shots for these guys as well, being as delicate as they are. I sat for some time recently, just watching the hatchlings putting on their show, bullying the egret chicks. They’re a hoot. I love those legs and feet in your first pic! That’s exactly how I feel — sometimes — on my hikes down here. I’m always, ALWAYS uplifted, but there are times when I’m quietly screaming for the developers to *stop* and for the government to listen. There are baby steps, though — I do believe there are MORE people (like us!) now than ever before. I really do… And that accounts for a LOT. Aren’t their legs great? Sometimes you’ll see them fishing in the deep waters, with just their heads peeking out. Thanks much! I was thrilled to have caught her taking a break, tending to her nest. She was so delicate with moving the branches around for quite some time, ensuring everything was just so…. 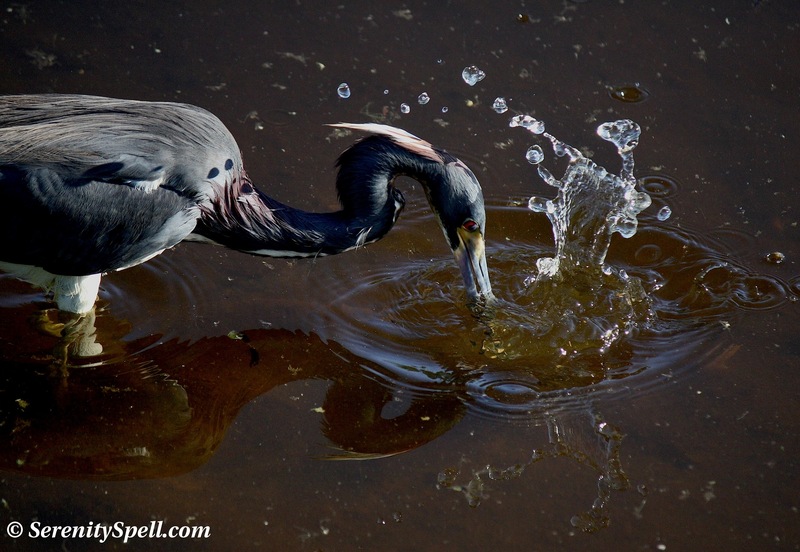 Herons are so majestic – great photos!